CEBPE antibody LS-C342662 is an unconjugated mouse monoclonal antibody to human CEBPE (C / EBP Epsilon). Validated for DB and WB. 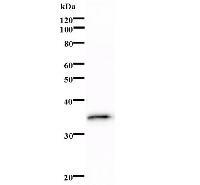 Western blot analysis of immunized recombinant protein, using anti-CEBPE monoclonal antibody.